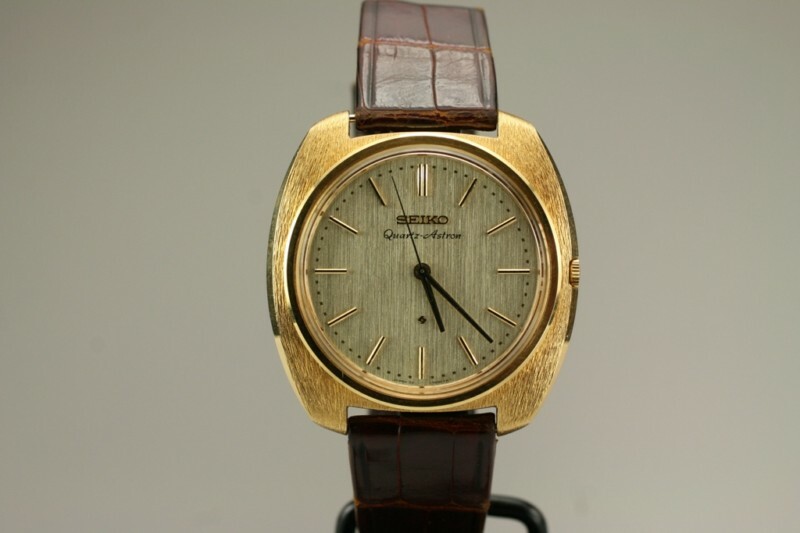 On Christmas Day 1969, Seiko released the world's first quartz powered watch. Costing 450,000 Yen ($1250), limited to just 200 pieces and only available in solid 18 karat yellow gold the Seiko Astron 35SQ was a complete game changer for the world of watchmaking. In just under a decade the Swiss Industry would be bending over backwards to compete against the influx of cheap and accurate Japanese quartz watches that were flooding the market ; but in 1969 it was a technological marvel. Most chronometer rated watches are accurate to within -4/+6 seconds a day yet the Astron was to within -0.2 seconds a day and +/- 5 seconds a month overall. This was a level of accuracy that was completely unprecedented within the the world of watchmaking and for the general public. Forty six years later we haven't seen a jump in technology that has affected the industry in the same way, yet at the time some thought of it was a novelty. A week after the watch was debuted, the New York Times wrote an article which led with "If you're one of those rare persons who must be accurate to within five seconds a month, the Japanese have a wristwatch for you" and looking back on that quote it seems terribly naive. Like Decca Records telling The Beatles that guitar music was on it's way out or thoughts that no-one would ever have a need for a personal computer, the NYT article throws shade on what would would turn out to be the biggest moment in watchmaking in the 20th Century. The company now known as Seiko Epson had been experimenting on electronic watches for a decade under the "59A Project". This program was tasked with developing a highly accurate battery operated wristwatch and three different approaches were taken : spring balance, tuning fork and quartz. In 1963 the Seiko Crystal Chronometer QC-951 was developed as a timer for the Tokyo Olympic games which was the first time a quartz timer had been somewhat portable, reducing it's size from that of a filing cabinet to a small desk clock. It would have the same daily accuracy rating as the Astron however could last for almost two years on a single size-D battery. Over the next five years Seiko were able to reduce the size and battery requirements of a quartz powered movement down to the size of a wristwatch. To further minimize the space used, the motor was spread out horizontally rather than vertically and the second hand was only to move in one second intervals to conserve battery life. I would love to have been a salesman on that day talking to a client about this watch, explaining that now you'll never need to worry about winding your watch ever again. Seiko now make a new watch under the Astron name which is permanently linked to GPS satellites allowing for instantaneous hour changes when crossing time zones. Whether this will be the next game changer for the watch world only time will tell. Whilst the original Seiko Astron-35SQ almost destroyed the traditional Swiss watch industry, it still is one of the greatest achievements in watch making history. For better or for worse, the industry wouldn't be the same without it. Through earthquakes and war, Kintaro Hattori succeeded in making Seiko a force of nature in watchmaking. The Grand and King Seiko represent the very best of what the Japanese watchmaker is capable of. Whilst looking for vintage adverts, I found an article from Motor Sport Magazine dated August, 1970. The topic? Reviewing the first three automatic chronographs, or chronomatics, from Breitling, Seiko and Heuer. If you enjoyed this article and would like weekly updates on everything posted to the site then sign up to the Timepiece Chronicle newsletter.